As one of the new board members for the U.S. 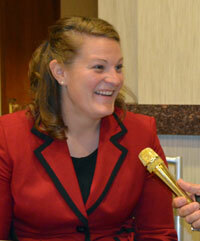 Farmers and Ranchers Alliance (USFRA), Katie Brenny representing the Federation of State Beef Councils got the gold mic treatment at the fall board meeting in Kansas City. Katie and her husband Ted live on a beef farm outside of Mazeppa, Minn., where they raise Charolais and Angus cattle, and she says USFRA is helping beef producers like her reach consumers in more ways than ever before. “I truly think it’s what the research shows and how can we tweak things to just constantly improve,” she said. 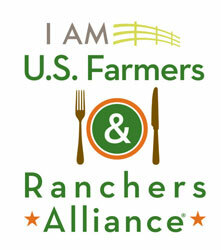 Her favorite USFRA projects so far have been the FARMLAND movie and Faces of Farming and Ranching. 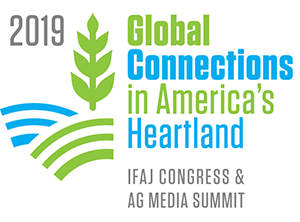 “As a millennial, I think it’s awesome to see friends of mine become Faces or people I know in FARMLAND to become movie stars, to really promote agriculture,” said Brenny.